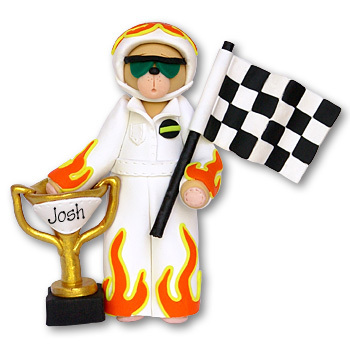 One of Deb's famous "Belly Bears" this Race Car Driver Belly Bear is perfect for any one you know that is into Nascar. This ornament is extremely detailed right down to the checkered flag and winners cup. It is lovingly handcrafted from polymer clay and designed by Debi Allison.